I know you're probably thinking that my posts are getting later & later right? In a sense you're correct but let me explain. There are certain challenges that I love to participate in on a weekly basis but I've been finding it hard to accomplish this goal. I've decided to make my challenge cards the day that they're posted instead of the day after. Make sense? Now to answer the question from yesterday's post......the things I LOVE about those cards: they all have ribbon, one sparkles & shows me a new way to use that butterfly set, one used my fave punch & a really cool color combo....last but not least---the pink one shows me how to use that Vanilla Hardware & that card is layered like mine usually are....LOVE THAT!!! 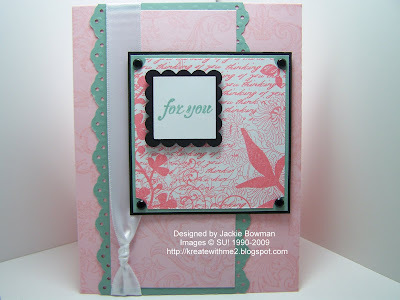 K, my post is for the Color Throwdown challenge to use Pink Pirouette, Sage Shadow & Cameo Coral. Not an easy combo for me but after looking @ today's Sketch Challenge from SCS.....it all came together! Thanks ladies for another wonderful challenge.....I'm looking forward to the next one!!! I'm off to complete my challenge cards for the blog groups I'm in.....wish me luck! Thanks so much for stopping by and have a great rest of the day!! Beautiful! So many people use the SCS sketch challenge in combination with the Throwdown each week and I love seeing all the different interpretations! This is so pretty! Thanks for playing the Throwdown! Gorgeous card, your coloring is just beautiful!! ;) TFS! Love the color combo and all of the lovely layers! Thanks for sharing! Jackie, this is beautiful! I haven't used this set for a while, I think it needs to get inky! Just a great card! Love this color combination! Love it, so fresh and dainty looking. Beautiful job, Jackie, with this challenge. Very Pretty Jackie!! Great colors! I would not have thought of that combo!! Great job on the sketch!! Beautiful! Great colors together and wonderful in your card! What gorgeous colors, Jackie....I really love the stamp you used and it looks awesome with the sketch....beautifully done!!! late, early, no matter. we all KNOW it's going to be something gorgeous!! And this is.... gorgeous that is. ohhh jackie,this is absolutely beautiful!TFS! Jackie: Beautiful card! Love the colors and the sketch! I also like your thought process -- create the card on the day of the challenge! Simple enough . . . I'm up to that challenge myself (but I'll start next week! wink, wink). Very pretty card! Great sketch! Thanks for playing the CTD! Jackie I love this card makes me wish I had done that challenge this week but I skipped it GEEZ!!! Wow Jackie, you did a fabulous job with all of it! Fantastic card! Soooo pretty Jackie- really dainty and lovely! This is drop dead gorgeous! Awesome job Jackie! Elegant and SO beautiful! Thanks for playing with us this week, Jackie!! Your use of punches and layers never ceases to catch my eye and make me think!!! You always do such a good job with this set too!! Very pretty, that's not a color combo I would have thought of, but it looks great. Wonderful job on both challenges, Jackie! Just gorgeous! Thanks for playing the Throwdown--hope to see you again next time!